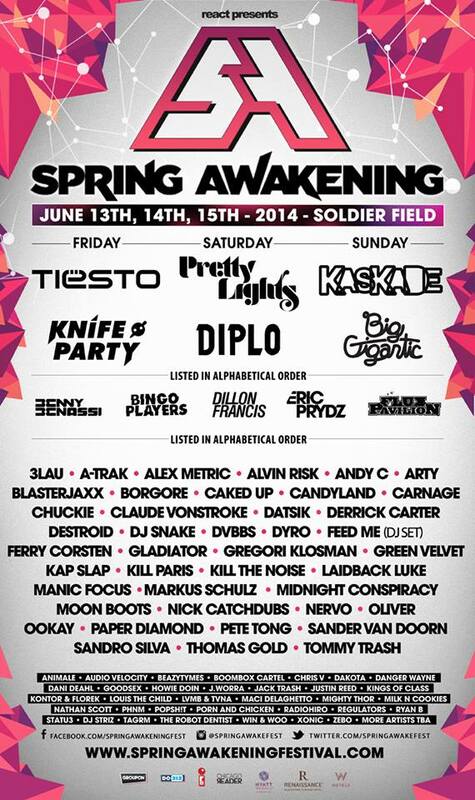 Chicago’s Spring Awakening Music Festival has just announced their 2014 lineup and it is absolutely on point. This is the third 3rd annual event for them and they’re looking to go bigger and better than last year. Last year’s festival descended upon Chicago’s historic Soldier Field with over 100 artists and about 90,000 attendees! This year’s lineup is sure to break these records. I know that React Presents will do us dirty. The festival will feature 2 main stages and top of the line production. The lineup is absolutely sick as it features huge talent as well as fresh blood. The subgenres span far and wide with these artists.